Originally a relief church, the foundation stone was laid in 1787. 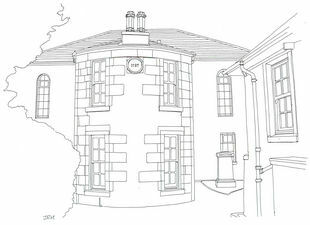 Designed by James Brown as a symmetrical two-storey building with a bow front, round-headed windows and piended roof. Interior altered, 1872, by Robert Baldie. Halls added 1931. Two stained glass windows, one on either side of a large pulpit. Three-manual organ by Forster & Andrews, moved here from a private residence in 1960.